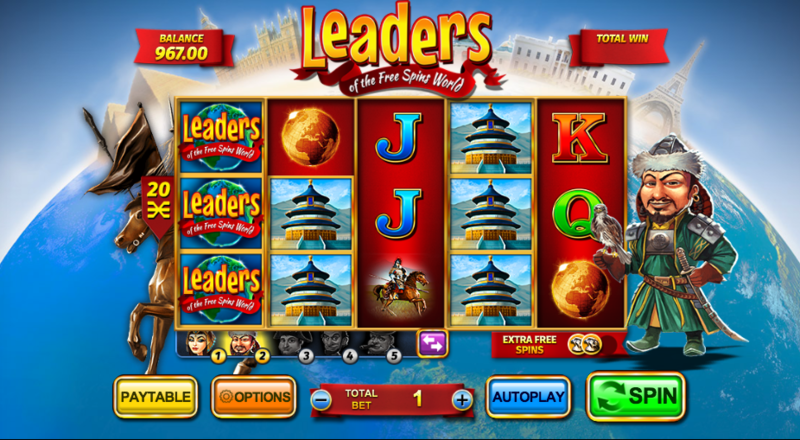 A trip through history and a chance to meet some well-known characters awaits online slots fans who fancy their chances on this enjoyable release from Inspired Gaming; it’s called Leaders of the Free Spins World and the longer you play, the better it gets. Leaders of the Free Spins World is a five reel slot with three rows and twenty fixed paylines; when you start the game Cleopatra will be standing next to the reels but that characters will change as you progress. The backdrop shows a distant view of the earth complete with famous landmarks. Red/blue flags are wild and substitute for all others to form winning combinations except for the five characters – Cleopatra, Genghis Khan, Napoleon, Abraham Lincoln and William Churchill. Leaders of the Free Spins World has five levels corresponding to the five famous leaders/mad men listed above and after a free spins round you’ll get to spin a Wheel of Fortune which may advance you to the next era and award tokens or just award tokens which will add extra spins during the feature. This is triggered by landing three of whichever leader is active anywhere on reels one, three or five; the spins take place on a bigger, 5 x 4 set of reels and you” receive the number of spins stated below plus the number of tokens you have. Cleopatra – six free spins with just three randomly selected symbols on the reels. Genghis Khan – six free spins with a sticky wild on reel three; a compass symbol landing will expand the wild. Napoleon – six free spins with any wilds landing remaining in place for up to three spins. Abe Lincoln – four free spins with reel three completely wild and a win multiplier which increases by 1x on every spin. Churchill – five free spins with stacked wilds on the reel set. Nudge Reel – if there are two scatter in view and a third partly visible, the latter may be nudged onto the reels to trigger the feature. Cascade Win – all reels are nudged down three steps for (hopefully) a nice win. 5 Of A Kind – up to twenty five of a king wins are possible. Big Win – a guaranteed big win. Bonus Chance – extra scatters are added to the reel set. Leaders of the Free Spins World may have a tongue twisting title but it’s an engaging slot with a well thought out level progression system and lots of extra features to aim for. 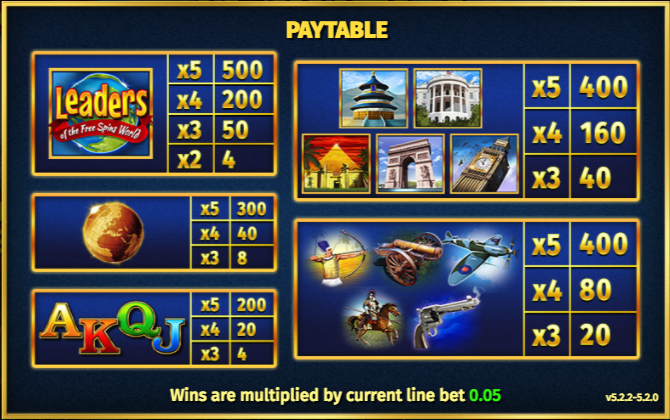 The free spins and the modifiers seem to trigger regularly and there’s an RTP of 95.00%.